Whether your meeting is planned or impromptu, a room booking solution ensures there’s always a place to meet from any touchpoint. 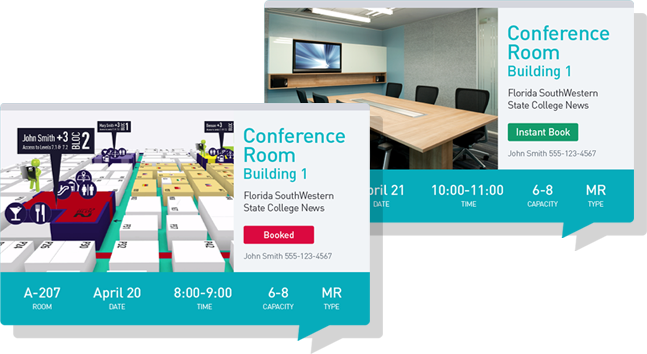 Whether your vision for an accurate conference room reservation solution includes the ability to book vacant rooms right at the door, or enhances the way your attendees find a scheduled meeting; 22MILES Publisher Pro can handle it all. 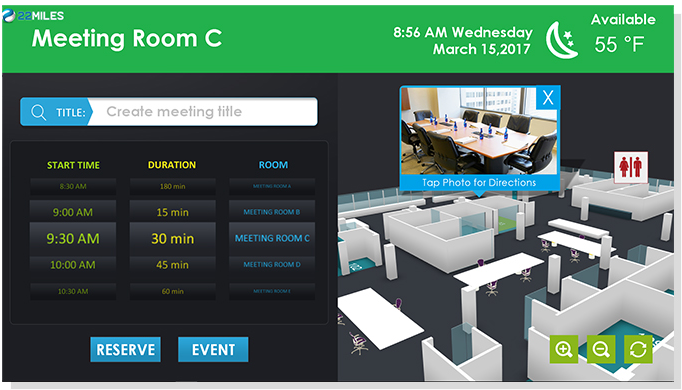 Our all-in-one platform enables you to bring your meeting status right to the conference room door, highlight vacant rooms on a 3D wayfinding map, and even drive content to the mobile devices of your attendees. Publisher Pro natively supports and syncs with event systems such as Office 365, Condeco, Google Calendar, EMS, Crestron, and other read to write event management softwares enabling for an automated and efficient approach towards Room Booking. 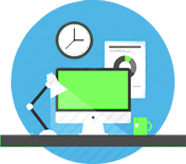 Agile Environment Office Design, "Hot Desking & Hoteling"
Empower employees at any organization to preschedule their workplace. 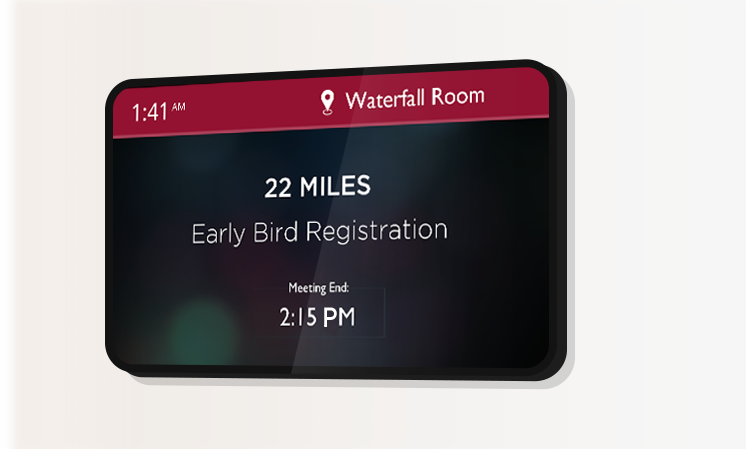 Meetings can be booked at multiple touchpoints — mobile apps, kiosks and with 3rd party integrations. Don't need to stick to "assigned sitting" be able to move around to any available space and visually understand your open office space. 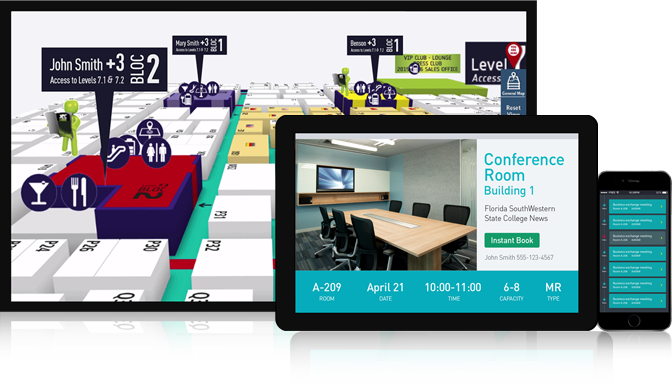 Install discrete touchscreen tablets outside your conference room that features the room reservation status, scheduled meetings, and available times to use the room. 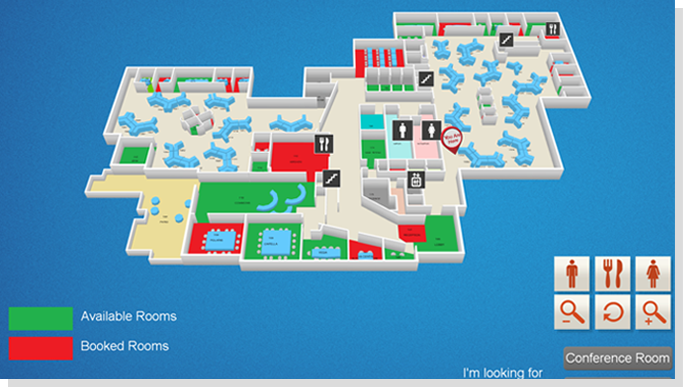 Brightsign room booking tablets are supported with Enterprise Exchange or other event software. Optimize office and staff performance with a customized mobile experience that enables you to book conference rooms on the go. 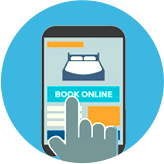 Use the 22MILES mobile app builder or SDK plug-in to create a hotedivng to room booking experience providing an overview of available rooms that match meeting requirements. With integrations to any of your calendar booking software drive productivity by creating a dynamic and connected environment at their fingertips. Hotedivng and Hotdesking can easily be managed through an iOS or Android corporate app using Active Directory and even SSO integrations with proximity controls. 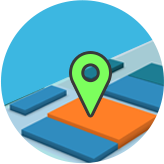 Beacon and WIFI integration can easily be incorporated into the experience with push notifications for people finders and meeting locators in real-time. Incorporate our AR plug-in with image recognition to route your space in real-time and book your room through AR.